This is a great little book and really easy to make. It can be used as a special card or invitation, as a memory keepsake or wedding favour, with a photo and beautiful poem wrote inside. You may even want to make a few and hang them on your Christmas tree with special messages inside. There are so many ways you can use this little book, just let your imagination run wild. 1. 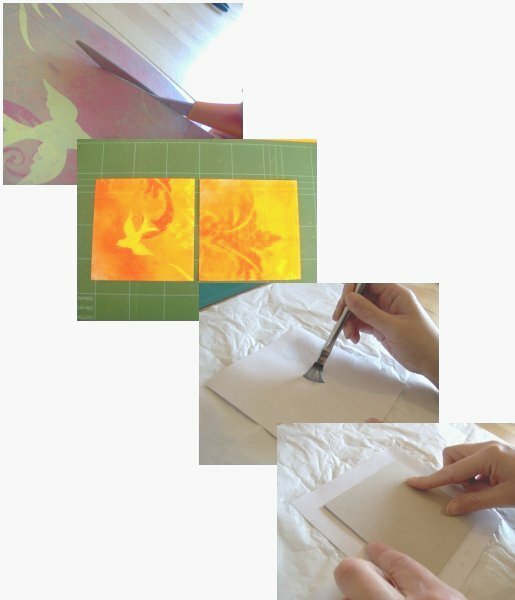 Using either scissors or a craft knife and cutting mat cut a piece of paper for the inside pages 8in x 8in (20¼ cm x 20¼ cm). 2. 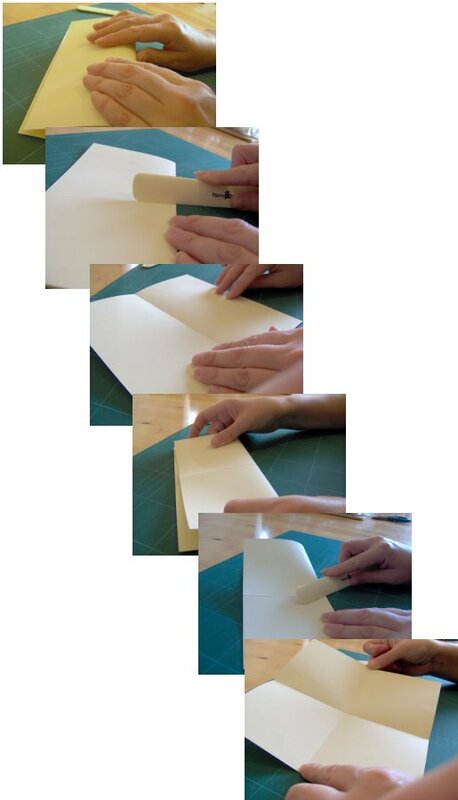 Fold the paper in half and press the crease with the bone folder. Open out and fold in half again in the opposite direction, pressing again with the bone folder, open out. 3. 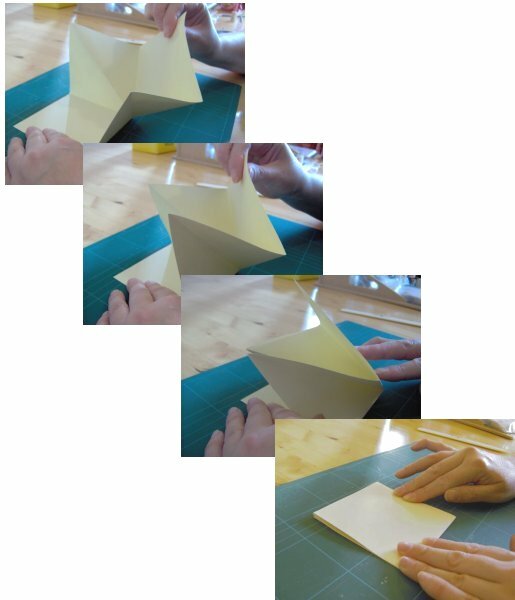 Turn the paper over and fold a diagonal fold to make a triangle, press the crease. Open out and turn the paper over again. 4. Your piece of paper after folding should be creased into four squares, two whole squares opposite each other, and the other two squares should be split into two triangles each. 5. Now lift the corner of one whole square and place it on top of the other whole square, pushing in the sides as you go, they should fold easily. Press the folds. By holding the open ends it should now open and close easily. Put the folded paper square to one side while you make the cover. 6. 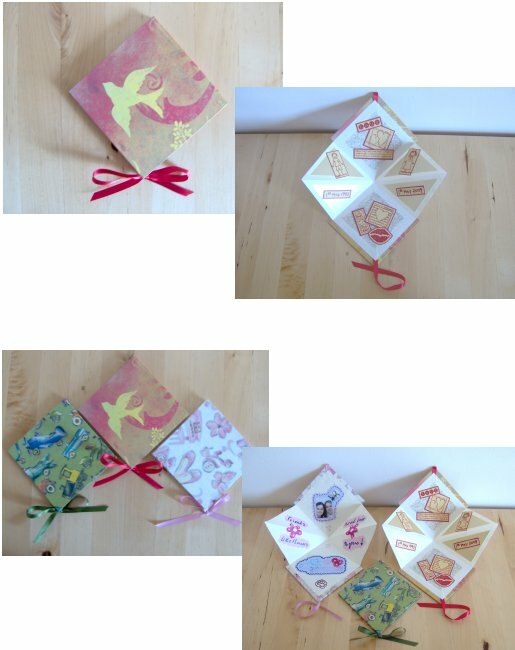 Cut two pieces of thick card or book board 4¼in x 4¼in (11cm x 11cm) for the covers. 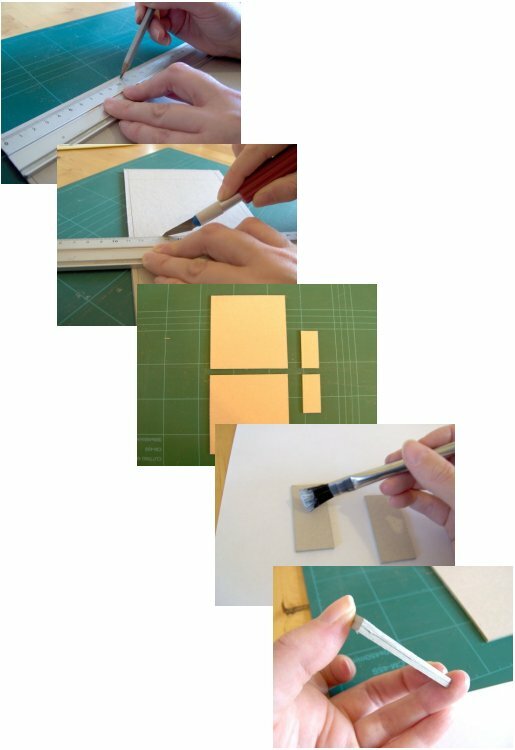 Cut two small rectangles 2in x 1in (5cm x 2½cm), glue the two small rectangles together and put to one side (you don’t need to make one of these each time you make this keepsake book, it can be used over and over again to mark the corners of the paper we are going to cut off). 7. 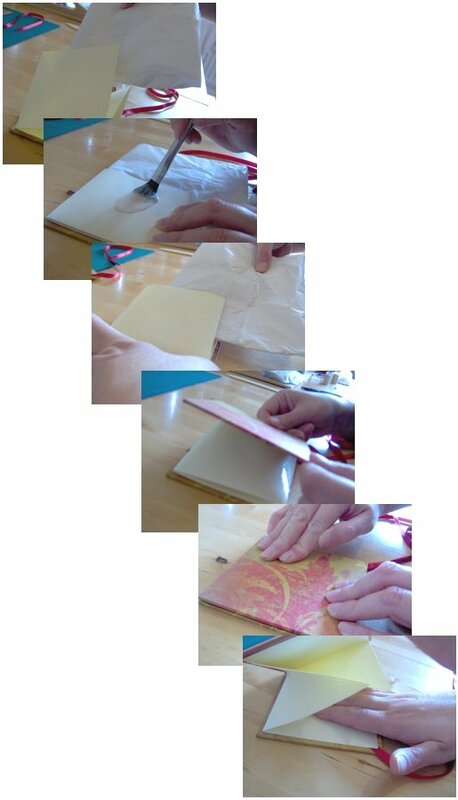 Using either scissors or a craft knife and cutting mat cut two pieces of decorative paper 6in x 6in (15cm x 15cm). Place one of the pieces right-side down onto some scrap paper and cover with PVA glue, spreading the glue from the middle to the edges. Centre one of the pieces of card onto the glued paper and press down. 8. 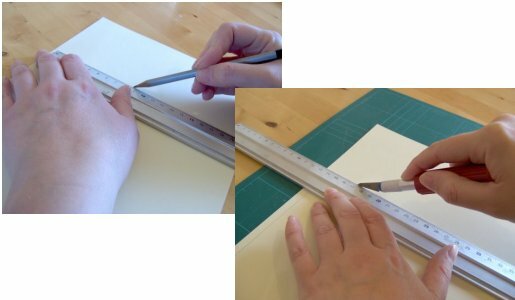 Place the small rectangle of card upright on the corner of the glued paper butting it up against the point of the square of card, using this as a guide cut off the corner of the paper using the craft knife. Repeat on the other three corners. This will leave you with four tabs of paper that will be folded over to secure onto the wrong side of the card. 9. 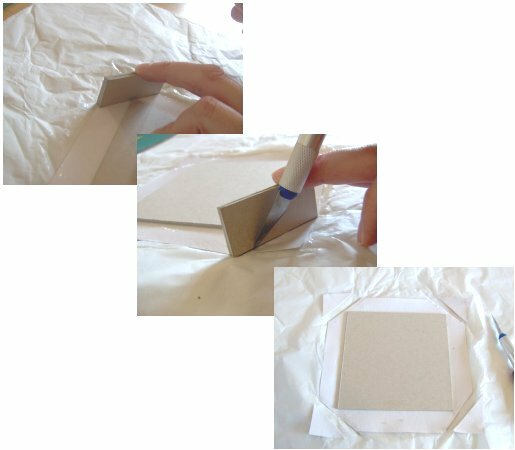 Carefully lift off from the scrap paper and place onto a clean sheet (this is to try and stop any glue from going onto the right side of the decorated paper). Fold over one of the glued tabs and press onto the card, then fold over the paper tab on the opposite side and press down. Using the bone folder/round knife, tuck in the little protruding edges of paper before folding over and pressing the last two side tabs. Put to one side and cover the second piece of square card in the same way. Glue a length of ribbon at the corners that will be used to open the keepsake book. Wipe off any excess glue and leave to dry. 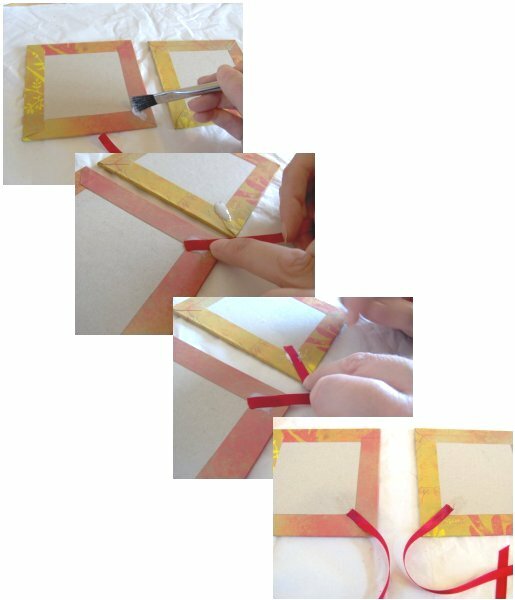 Glue a length of ribbon at the corners that will be used to open the keepsake book. Wipe off any excess glue and leave to dry. 10. Now take the piece of folded paper that will be the inside of your book and tuck a piece of scrap paper inside so that there is plenty sticking out. Glue one side of the paper, spreading the glue from the centre to the edges (the scrap paper stops any glue from going onto the rest of the folded paper). Remove the scrap paper and stick the glued side of the folded paper to the back of one of the covered pieces of card, making sure that it is placed close to the edge at the corner opposite the ribbon on the card and that the open end of the paper and the ribbon are at the same end. Open the paper out a little so that you can smooth it down onto the card. Gently wipe off any excess glue. 11. 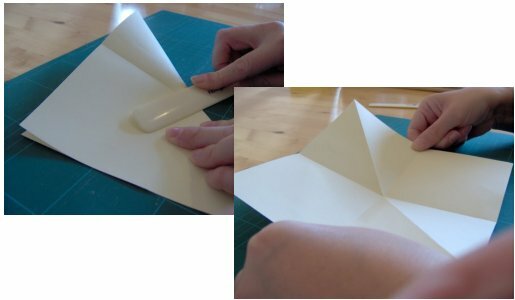 Tuck in some more scrap paper into the folded paper and glue the other side as before. Remove the scrap paper and place the other piece of covered card on top of the glued paper, lining it up with the first piece of card and the ribbon. Turn over and open it out a little so as to smooth down the paper onto the card. Gently wipe off any excess glue. 12. Tuck in a couple of pieces of greaseproof paper. 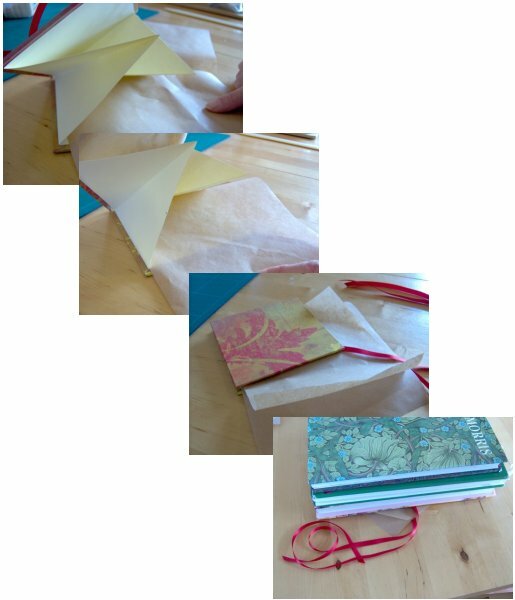 Carefully put some heavy books on top of your keepsake book and leave to dry. 13. 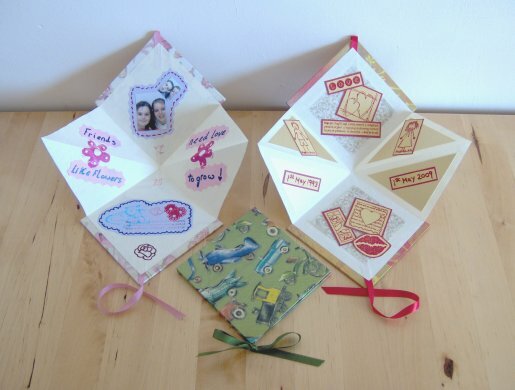 Once dried you can decorate the inside and outside of your keepsake book.